Most of the energy consumed by living species on earth stems directly or indirectly from the sunlight harvested by photosynthetic cells. The light harvesting apparatus works like a solar cell, and optimizing its efficiency for the various habitats of life forms was a key design principle of the apparatus. 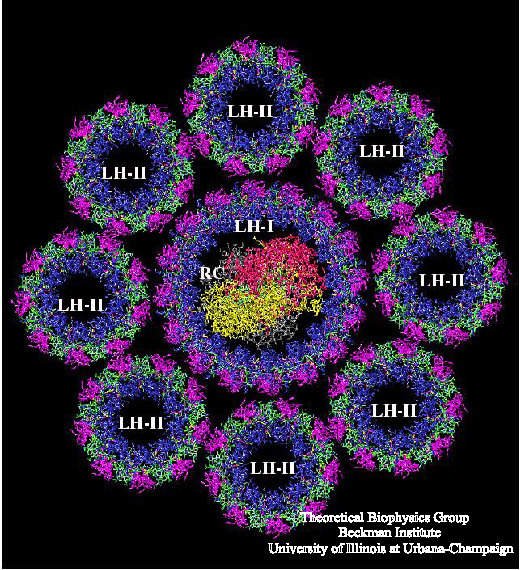 After exploring for decades the role of individual molecules in light harvesting, chlorophylls, carotenoids, and small aggregates of these, we can now put their findings together to calculate the overall efficiency and operational characteristics of a particular light harvesting system, that of purple bacteria. 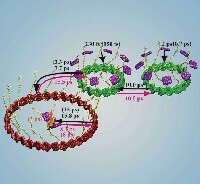 Based on structural biology, spectroscopy, and quantum mechanical calculations, the kinetic scheme shown in the below figure was devised to show how the energy gained by the system through the absorption of a photon is transferred on towards the photosynthetic reaction center. In the reaction center, the energy is used to generate a membrane potential, which provides the energy for further metabolic processes. The kinetic scheme represents a remarkable conceptual achievement in that it shows that excitation transfer times can be calculated almost quantitatively through application of quantum mechanics to known atomic geometries. Details of the research program leading behind this result can be found in my earlier quantum biology webpages at the Theoretical Biophysics Group at UIUC. A streaming video movie gives a 5 min introduction to the atomic level structure and function of the photosynthetic unit of purple bacteria. 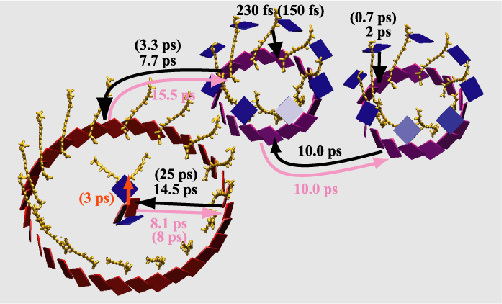 The ability to calculate energy transfer times from atomic structures with high accuracy opens the avenue to study how structural changes affect energy transfer times and, hence, the efficiency of the light harvesting system. Ultimately, we would like to answer the question: how can one arrange a given number of pigments with certain absorption properties in such a way that they funnel light towards the reaction center with minimal loss or that they provide the greatest protection from photoreactive damage through excess light? We can gain insights to this question by learning from nature and looking at the strategies employed in different photosynthetic systems. 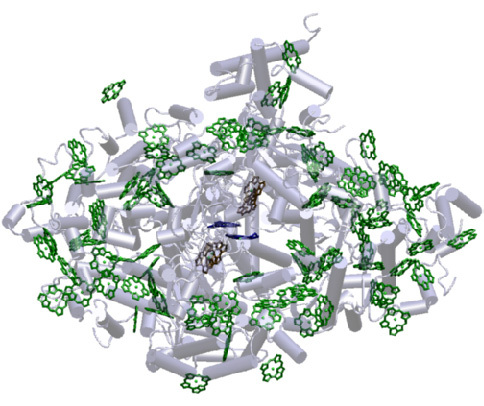 After studying the photosynthetic system of purple bacteria, we investigated the photosystem I of the cyanobacterium S. elongatus, whose structure (shown in the figure left) was recently resolved in atomic resolution. 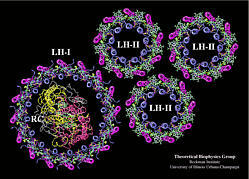 In contrast to the highly modular and symmetric structures of purple bacteria, the geometric arrangements of chlorophylls in photosystem I appears to be rather random. However, a more detailed analysis of the apparatus shows that this system has been designed with a high degree of fault tolerance and optimality: pruning single and even multiple chlorophylls hardly affects the efficiency of the apparatus; altering the chlorophylls' arrangement though leads to a reduction of efficiency. Acknowledging that the chlorophyll arrangement is highly optimal is only a first step. We now need to understand what structural features underlie this high optimality, so that we can transfer the lessons learned from nature to design artificial systems with high optimality.